When it comes to scheduling your workforce, the devil is in the details. And oh what a lot of details there are. Managers for municipalities, retailers, fire and police departments, or universities that hire student workers must balance the demands of each shift with the qualifications and preferences of each worker, all while complying with collective bargaining agreements and minimizing overcome costs. Tracking, managing, and controlling these variables with widely used manual paper-based or spreadsheet systems is difficult and time-consuming at best. Compounding the challenge is the dynamic nature of schedules. Someone is always calling in sick or asking for a change. With manual scheduling processes, managers find themselves going back to the drawing board whenever a change is necessary, repeatedly reworking and redistributing the entire schedule. 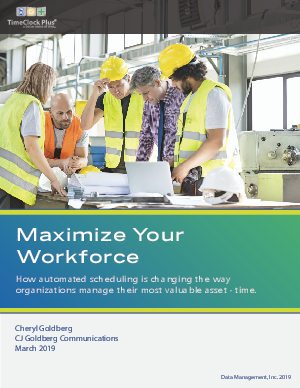 This white paper details the complexities your managers encounter with manual scheduling--and shows you a better way. With an Advanced Scheduling solution, your organization can automate scheduling processes. No longer will your managers tear their hair out making sure shifts are covered with the right staff. Advanced scheduling solutions get schedules right the first time and enable your managers to instantly adapt to changes. Not only do managers become more efficient, they reduce overcome costs and can rest easy knowing that they’re in compliance with union agreements and labor laws.